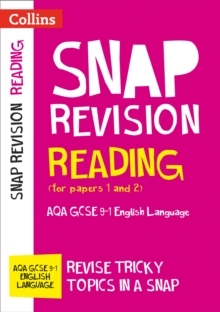 This is no ordinary GCSE Grade 9-1 English Language revision guide - it's focussed revision designed to help you with the reading component of papers 1 and 2 in the AQA GCSE Grade 9-1 exam. Need to brush up on your writing skills too? Writing for papers 1 and 2 (9780008242336) is another excellent GCSE Grade 9-1 revision guide that will get you ready for your AQA English Language exam.